We are engaged in providing a wide range of Stainless Steel Corrugated Hoses. These are made from high quality of raw material. These are provided in different specification to meet the diverse requirement of client. American Rubber Industries is a well known name in the industry that offers a vast series of Stainless Steel Corrugated Hoses. 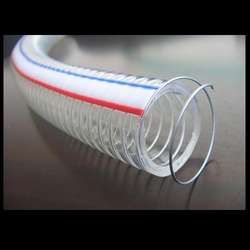 We make use quality grade stainless steel procured from our reliable and trusted vendors for manufacturing these corrugated hoses. These durable hoses are provided in various specifications and tested on different quality parameters before the final dispatch. We are an acclaimed name engaged in offering our precious clients a superior quality range of Steel Wire Braid Hose that is for medium pressure hydraulic requirements. This hose is manufactured using optimum grade raw-material and sophisticated technology in synchronization with industry standards. In order to ensure quality, the entire range is rigorously tested on various parameters by our quality controllers. Keeping in mind the diverse requirements of our clients, we provide this hose in various sizes and specifications.